Three intrepid keepers at Paradise Wildlife Park are doing their bit for tapirs by bungee jumping to raise funds for tapir conservation. The keepers launched their fundraising effort at the Wildlife Park in Broxbourne in Hertfordshire on World Tapir Day on 27 April. They take the plunge on 21 June. 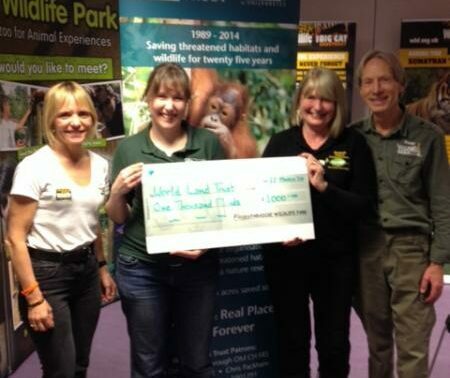 Funds raised from the bungee jump will be donated to World Land Trust’s (WLT) Ecuador Rainforests Project where the Mountain Tapir could face extinction in the next 20 years. James Cork is leading the team. 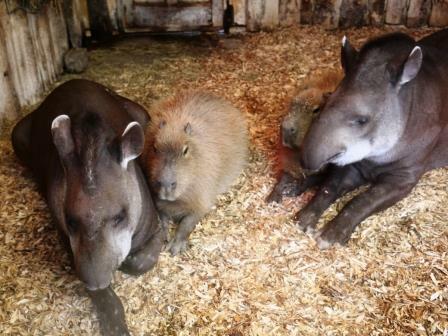 He is Head of Paddocks Section, where the park’s tapirs have their home. He will be joined by Carrie Arnold and Callum Bullworthy. The team have made a short film to promote what the wildlife park is doing to help protect the tapir and to explain the reasons for the jump. On the day the bungee jump will be filmed by the wildlife park’s media team. James will be wearing a baby Lowland Tapir costume and Carrie a Malayan Tapir costume! Virtually unchanged in over 50 million years, the tapir is an ancient relative of the horse and there are four species. 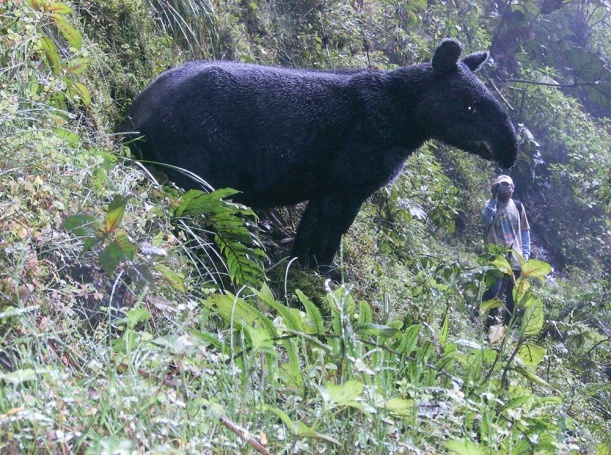 The Mountain Tapir (pictured top) is found only in Colombia and Ecuador and although threatened with extinction has safe havens in both Fundación Jocotoco and Fundación EcoMinga reserves. Sometimes known as the Woolly Tapir because of its dense coat, the Mountain Tapir is the smallest of the four tapir species. It has a white lower lip and prehensile snout. Bairds Tapir, the largest mammal in the Americas, is Belize’s national animal and protected on Programme for Belize lands. The largest tapir species, also endangered, is the Malayan Tapir, the only tapir species found in Asia; it has distinctive dark grey and whitish markings. Paradise Wildlife Park provides a safe haven for the fourth – the Brazilian, or Lowland Tapir – which occurs in the wild in a wider range from northern South America to southern Brazil, Paraguay and northern Argentina.